Synergeering recently worked with a U.S. based construction equipment OEM on their latest fleet of products.The goal was to obtain a functional rapid prototype part before tooling was cut to prove out the designs fit and functionality. The prototype parts that were produced included functional heat exhaust grills that were used directly on the vehicle. The parts, made with GF-Nylon material, (RapidNylon®) were able to easily stand up to the heat from a 100-hp engine, (seen below). The customer was able to successfully test the air flow and heat management using the parts. 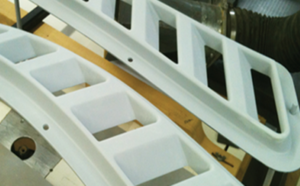 Parts were produced directly from CAD without the use of tooling and delivered in just a week. Parts were also later painted to mimic the final production part.